The first leaked telephone recording documents (link to recording) the orders PM Erdoğan gives to Habertürk in relation to President Abdullah Gül and leader of the opposition MHP (Nationalist Movement Party), Devlet Bahçeli. On June 4, 2013, Devlet Bahçeli met with President Gül. After the meeting, he gave a statement to the press. Habertürk published a news ticker from the speech that reads, “D. Bahçeli invites Gül to assume responsibility in terms of the Gezi incident”. In response, Erdoğan gives the directive to remove the ticker and cut the feed. PM: Fatih look, I’m in Morocco watching the television and Bahçeli’s entire speech is being transmitted in the news ticker at the bottom of the screen. Mehmet Fatih Saraç: I understand sir. Ok.
Mehmet Fatih Saraç: Ok sir. PM: So, Bahçeli made this statement and your channel is constantly reporting this statement in the news ticker at the bottom of the screen. Mehmet Fatih Saraç: Ok sir, I understand sir. Right away. Mehmet Fatih Saraç: Umm ok, umm, I’m at your order. Everything is clear now. Mehmet Fatih Saraç: I’m doing it right away sir. After the reprimand, Fatih Saraç calls an employee of Habertürk by the name of Abdullah and asks him to intervene in the live feed. Fatih Saraç: Abdullah, can you please urgently remove the news on Bahçeli and the news ticker that we are broadcasting. Abdullah: We’ve removed it, you mean the current one right? Fatih Saraç: Yes, remove it immediately. Fatih Saraç: Remove the sliding news at the bottom as well immediately please, just forget it, remove it. Mehmet Fatih Saraç: PM called me. He told me that we are broadcasting the statement ‘the president’s duty is to intervene’. Mehmet Fatih Saraç: He told me that he was in Morocco, that I was tiring him. Kenan: Brother what can we do. How shall we do the last minute broadcasts? When Bahçeli makes a statement, we publish it. Mehmet Fatih Saraç: He says he’s watching from Morocco, lets remove this story and ease the atmosphere. Mehmet Fatih Saraç: Did you sort it out Abdullah? Abdullah: We removed both the image and the sliding news ticker. He (Bahçeli) has more moderate statements, we are about to enter those. Mehmet Fatih Saraç: Who overlooked this? Abdullah: No that sentence is after ‘The Nationalists will not go out on the street’. Mehmet Fatih Saraç: In that sentence, there is a call for calmness towards the Nationalists. But in the other sentence, the PM doesn’t want to share his authority and power with anyone else. Ok? These days, the discussions in Turkey centre on media censorship and government coercion of mainstream media establishments. Restrictions on press freedom is nothing new in Turkey. However, since February 4th, 2014, a number of recorded telephone conversations have been leaked onto the internet which seem to give the public a more tangible indication of how exactly mainstream media establishments are muzzled. If we are to believe the authenticity of the recordings, they prove beyond any shadow of doubt the level of government control and censorship over the content published by the Turkish media. First of all, the authenticity of the leaked telephone recordings have not been officially validated. However, both PM Erdoğan and journalist Fatih Altaylı – two individuals who feature in the recordings – have given tacit acceptance to the authenticity of the recordings in the following ways. In PM Erdoğan’s case, he admitted to making a phone call to the media organisation Habertürk from Morocco – the context of one leaked conversation. Fatih Altaylı attended a television interview after his implication in the leaks, stating “the honor of journalism is being trampled on. Instructions rain down every day from various places. Can you write what you want? Everybody is afraid”. The mainstream media organisations in Turkey are owned by conglomerates that have business interests in the energy, construction and mining sectors which are heavily dependent on government contracts. Not surprisingly, this results in such media outlets playing to the tune of the government. The leaked phone conversations thus far concerns the publications of Habertürk in specific. Habertürk is a media group that has both a newspaper and a TV channel. So far, 6 telephone recordings have been leaked. I will be publishing the transcriptions of the leaked phone conversations as they appear on the web. On August 26, Yeni Safak published an email interview conducted by reporter Burcu Bulut with Noam Chomsky. 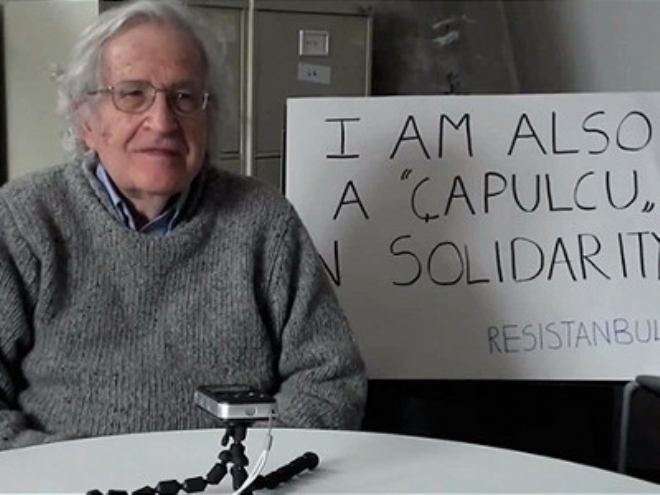 On Friday, Chomsky published the contents of the email interview with questions and answers on his personal website, revelaling the stark difference between Chomsky’s published text and the interview published in Yeni Şafak. Bulut reproached the initial criticisms levelled against her, complaining of being the target of a smear campaign. Later, Yeni Safak released a statement admitting to plagiarism in “three sentences”: “We saw a mass resistance, made up of Morsi supporters, which moved with a longing of democracy,” “The tragedy of Asma, the massacred daughter of senior Muslim Brotherhood politician Mohammad al-Beltagy, cannot be forgotten” and “Lebanon and Tunisia are also at the cannon’s end”. Thorough the statement, Yeni Safak nevertheless insisted that the criticisms leveled against the paper were ideologically driven. In reality, it is clear that not only did the paper mistranslate Chomsky to change the meaning of what he was saying to suit the ideological message the paper wanted to give, but half the stuff that Chomsky allegedly said did not exist in the first place! The grammar of the second set of questions and answers (from the transcript published by Yeni Safak) are so appalling that it is embarrassing the newspaper would actually expect people to believe those words were written by Chomsky, let alone anyone. It is blatant that an online translator was used to translate a text from Turkish to English. The original is often unintelligible and includes a Turkish idiom that was translated into English literally. In another part of the interview, Chomsky allegedly said Turkey is a powerful country and that Prime Minister Recep Tayyip Erdoğan is a charismatic leader. He reportedly added that Turkey is the only nation in the Middle East that connects the West and the East. “It is a good mediator as well as a Muslim and deeply democratic country,” Chomsky reportedly said. Make no mistake that this Chomsky interview incident is a scandal added to a long list of examples that go well beyond ‘journalistic irresponsibility’. Newspapers in Turkey have either become the mouth piece of the AKP government publishing lies and fake interviews as a part of the propaganda machine or sources of non-factual anti-AKP rebuttals based on ideological positions. In short, the political polarisation in Turkey has reduced the quality of journalism so far down the drain that the number of articles which live up to international standards is close to zero. About 20 days ago, the media picked up on the daily Sabah newspaper’s censorship of its own Ombudsman’s (Yavuz Baydar) articles. The censored articles were critical of the complicit support most media outlets (including the one he worked at) gave the AKP and the level of censorship/auto-censorship throughout the Gezi protests. After Yavuz Baydar was censored twice, he was shown the door on the 23rd July, fired like so many other journalists. If a newspaper censoring its own Ombudsman does not make that paper a joke, I truly don’t know what does. According to the Turkish Journalists Union, 22 journalists have been fired and another 37 have had to resign since the Gezi Park protests erupted in late May. Moreover, 12 journalists have been seriously injured whilst covering the events, not to mention scores that incurred minor injuries. All in all, although Freedom of Press in Turkey has been declining over the past few years, the plummet continues in the aftermath of the Gezi incidents. Throughout the protests, Erdoğan has blamed CNN International, BBC and Reuters -to name a few- as culprits during the Gezi Protests. Amanpour’s coverage on CNN became the target of AKP’s fury. Meanwhile, a newspaper in the pocket of the government published a fake front page article titled ‘Dirty Confessions’ pretending that they interviewed Amanpour where she supposedly admitted to covering the recent protests in Turkey on behalf of business interests that wanted to hurt the country’s economy. On July 24, an open letter was published as a full-page advertisement in The Time magazine which was signed by more than 30 renowned artists, writers and scholars, including such household names as Sean Penn, Vanessa Redgrave, Susan Sarandon Sir Ben Kingsley, Andrew Mango and Fazıl Say. The signatories “vigorously condemn” the way in which Erdoğan and his police clamped down on protesters. The open letter blames Erdoğan for dismissing the deaths that occurred during the protests and that it is an offense that can land him in Strasbourg, defending his crimes at the ECHR. Not surprisingly, Erdoğan was fuming. His response was to insult the signatories and to state that he will be suing Time in the close future. His EU Minister Egemen Bağış referred to the letter as “hate crime” and other cabinet ministers followed suit with similar statements. A government agency, the Savings Deposit Insurance Fund (TMSF), has been seizing publicly indebted media entities and selling them off to companies close to the government. Very recently, the TMSF sold Sky360 television channel and the Aksam newspaper – used to be critical of the government – to the Kolin-Limak-Cengiz consortium, without holding any public tender or auction. The same consortium had been awarded the project to build a third bridge over the Bosporus. The TV station and the newspaper were handed to the consortium virtually as the bonus of the bridge contract. More bad news, Taraf Newspaper’s former editor-in-chief Ahmet Altan was sentenced to 11 months and 20 days in jail for “criticising Erdoğan” over the Uludere incident (2011) where two Turkish F-16 jets accidentally bombed 35 Turkish citizens, mistaking them for Kurdish terrorists. This sentence was converted to a 7000 TL fine but such sentences are meant to discourage independent journalism in the first place anyway. In reality, the Media in Turkey has been under the thumb for as long as I care to remember. 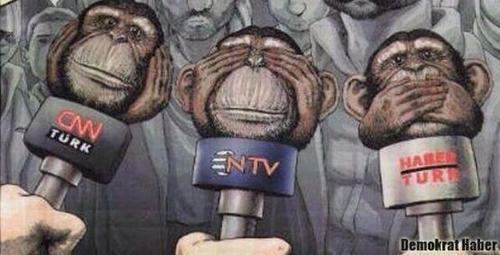 Turkish news outlets are in a habit of covering up truths. Not surprisingly, the Kurds have been affected the most from such practices. In fact, during the early days of the protests, the Kurds were telling the rest of the protesters that people were finally able to realise the media bias because it had happened to them, whereas they had turned a blind eye to the bias whilst the Kurds were being opressed for so long. In his article in New York Times, Baydar writes about how the media backed off from the Uludere incident after being instructed by Erdoğan. Dirty alliances between governments and media companies and their handshakes behind closed doors damage journalists’ role as public watchdogs and prevent them from scrutinizing cronyism and abuses of power. And those who benefit from a continuation of corrupt practices also systematically seek to prevent serious investigative journalism. The problem is simple: one need only follow the money. Turkey’s mainstream media is owned by moguls who operate in other major sectors of the economy like telecommunications, banking and construction. Since only a few large TV channels and newspapers make profits, the proprietors tend to keep them as bait for the government, which needs media managers who are submissive to the will of politicians. It is fertile ground for carrot-and-stick policies. The more willing the proprietors are, the more their greed is met. Several of Turkey’s media moguls have been given extensive favors through public-works contracts, including huge urban construction projects in Istanbul. It’s not possible to conduct serious journalism in such a polluted system. These conflicts of interest have transformed Turkey’s major newsrooms into prisons: coverage of economic corruption in Turkey today is almost zero. There are a few tiny, brave independent outlets, which break stories that are critical of the government, but these stories are hardly ever picked up by the mainstream media and therefore have little impact.